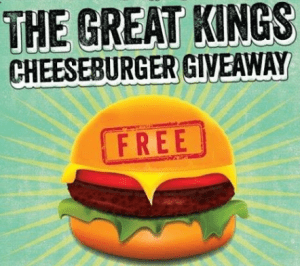 Free Cheeseburger at Kings on Wednesday, September 18, 2013 (+ $1 Red Sox Tickets)! Update: Also, Eater Boston is reporting that The Tap will have free cheeseburgers too but you do need to purchase a $5 Sam Adams today, September 18, 2013 to get the offer from The Tap. In honor of National Cheeseburger Day, Kings is giving away free cheeseburgers on Wednesday, 9/18/13 from 12pm to 10pm. You can grab a free burger at the Dalton Street location in the Back Bay and Legacy Place in Dedham. This is one cheeseburger per person and offer valid while supplies last. For more info, please head here. Yum! If you go to Kings Back Bay around dinner time, you may want to grow or paint on a beard to get into Fenway Park to catch the Orioles game for $1!!! (Head to Gate E at 5:40pm with your beard, and find more info here). This post needs a like button! Yum!